What Causes Breast Cancer ? You are here: Home / Women's Health / What Causes Breast Cancer? Breast cancer intrigues the medical community. The disease has struck innumerable women in the last 60 years and it shows no sign of slowing down. In fact, the numbers are increasing each year. Not many diseases have received the same amount of time and effort in research as breast cancer or indeed any kind of cancer. To say that the studies done have been exhaustive and extensive is an understatement. Despite these multiple, frequent and ongoing studies, the cause of breast cancer is not yet known. However, there are certain factors which have been linked to an increased risk of breast cancer. These are called risk factors and the more risk factors you have the greater the likelihood that you will develop breast cancer. Bear in mind that there are people who have all the risk factors and still do not get breast cancer, and there are those who have no risk factors at all and who do. This has left scientists baffled and it leaves the general population confused. Your best bet for healthy breasts is to simply lead an overall healthy life and to keep your risk factor count low wherever possible. Breast cancer seems to be a modern disease – the developed nations of the world are more likely to develop the disease than those in the less-developed countries. Could this be a reflection of the distorted food and lifestyle habits that we call ‘normal’ today? Women are at higher risk for breast cancer than men. Women who put off having kids (past the age of 30) seem to be at a slightly higher risk for breast cancer. Those who have no kids at all are apparently at even higher risk. Those whose periods began early (before the age of 12) may be at higher risk for the disease too. Late menopause (past the age of 55) is another risk factor for breast cancer. This point and the previous two suggest that hormones may play a role in breast cancer development, but what exactly that link is, has yet to be discovered. 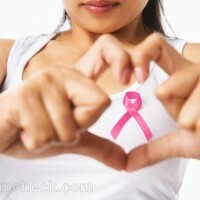 Age plays a significant role in the development of breast cancer. Older women between the ages of 40 and 60 are at higher risk for the condition and many do develop lumps in their breasts even though they turn out to be benign (non-cancerous). It is believed that cancer may be passed on through the genes. So if you have a family history of breast cancer, even if it is some distant aunt, then you may be at higher risk for it too. If the breast cancer gene is present in your chromosomes, there is a scary 85% chance that you will get breast cancer. Smoking is one of the biggest risk factors on this list. Smoking increases your risk of breast cancer manifold. Alcohol is another risk factor for breast cancer. The more you drink, the greater your risk. Overweight or obese people are much more likely to get breast cancer than those who maintain a healthy weight. Those who lead sedentary lifestyles – even if they are thin – are also at higher risk for breast cancer. Birth control pills have been linked to a higher incidence of breast cancer. Using deodorants which contain aluminum and parabens may increases the risk for breast cancer too as these substances are absorbed through the skin and can cause hormonal-type effects which can promote the growth of breast cancer cells. However, there are many conflicting studies on the subject and whether or not this is true is still debated. Just as highly debated is whether abortion/miscarriage increases the risk of breast cancer. Some doctors will insist that these conditions are conducive for the growth of cancer cells but there just simply is not enough reliable data as of now to back up that claim even though several medical professionals claim that theoretically abortion/miscarriage is linked to breast cancer. Where you live can also increase your risk of breast cancer. Certain places in the world have higher levels of radiation because of their proximity to nuclear power plants which may not have the safety measures in place to contain the radiation being emitted as part of their daily work. So if you live in such areas there is a chance that you will be exposed to radiation and thus be more prone to the development of malignant tumors as the chemistry of your cells literally undergoes a mutation under such environmental conditions. If you work in a chemical factory and are frequently exposed to harmful chemicals, you will be at much higher risk for breast cancer. If the results of a mammogram show that you have denser breast tissue than is the norm, it makes you more susceptible to breast cancer. So your doctor will want to keep a close eye on you and will ask you to come in for mammograms more frequently than usual. It would also be a good idea to give you a thorough breast examination at least once a month, especially since it is more difficult to detect a tumor in dense tissue. If you have a family history of breast cancer and know for a fact that your breast tissue is dense, you can request your doctor to do regular breast cancer screening if you can afford the tests. Previous patients of cancer who received radiation therapy as part of their treatments, especially around the chest area, are at higher risk of breast cancer. Certain types of hormonal replacement therapy (HRT) which are prescribed to menopausal women to reduce the intensity of menopause symptoms are also linked to a higher incidence of breast cancer. Combined hormonal therapy seems to have quite an effect in increasing breast cancer risk, but only-estrogen therapy does not seem to be linked to the disease. Your diet can also play a huge role in the development of breast cancer. Processed foods which are high in fat and sugar in particular can increase your risk, as can a lower intake of fruits, vegetables and grains.